The septennate or seventh year, during which the land is to lie fallow, and the celebration of the fiftieth year after seven Sabbatical cycles. As regards the latter, the Hebrew term "yobel" refers to the blast of the shofar on the Day of Atonement announcing the jubilee year (comp. = "trumpets of rams' horns"; Josh. vi. 4), though Ibn Ezra thinks it signifies the transfer of properties (comp. ; Isa. xviii. 7). 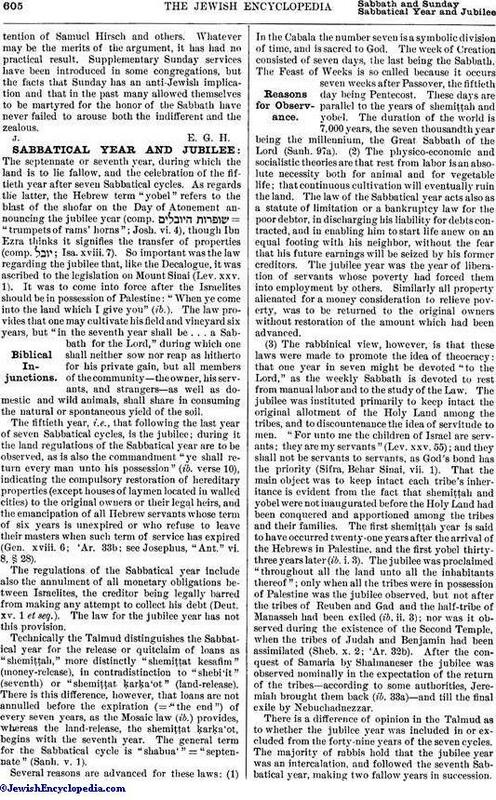 So important was the law regarding the jubilee that, like the Decalogue, it was ascribed to the legislation on Mount Sinai (Lev. xxv. 1). It was to come into force after the Israelites should be in possession of Palestine: "When ye come into the land which I give you" (ib.). 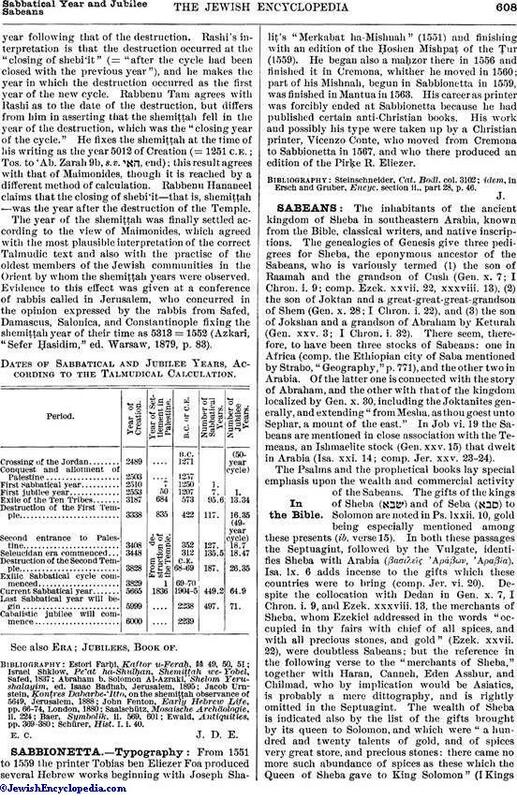 The law provides that one may cultivate his field and vineyard six years, but "in the seventh year shall be . . . a Sabbath for the Lord," during which one shall neither sow nor reap as hitherto for his private gain, but all members of the community—the owner, his servants, and strangers—as well as domestic and wild animals, shall share in consuming the natural or spontaneous yield of the soil. 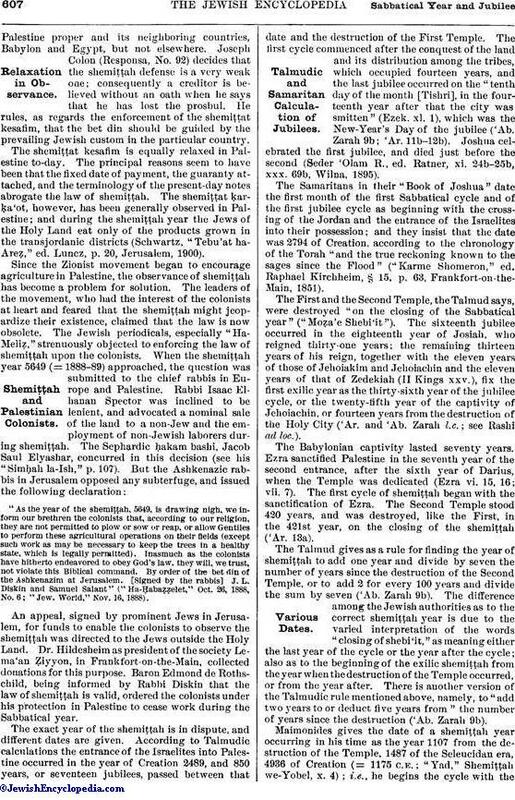 Maimonides gives the date of a shemiṭṭah year occurring in his time as the year 1107 from the destruction of the Temple, 1487 of the Seleucidan era, 4936 of Creation (= 1175 C.E. ; "Yad," Shemiṭṭah we-Yobel, x. 4); i.e., he begins the cycle with theyear following that of the destruction. Rashi's interpretation is that the destruction occurred at the "closing of shebi'it" (= "after the cycle had been closed with the previous year"), and he makes the year in which the destruction occurred as the first year of the new cycle. Rabbenu Tam agrees with Rashi as to the date of the destruction, but differs from him in asserting that the shemiṭṭah fell in the year of the destruction, which was the "closing year of the cycle." He fixes the shemiṭṭah at the time of his writing as the year 5012 of Creation (= 1251 C.E. ; Tos. to 'Ab. Zarah 9b, s.v. , end); this result agrees with that of Maimonides, though it is reached by a different method of calculation. 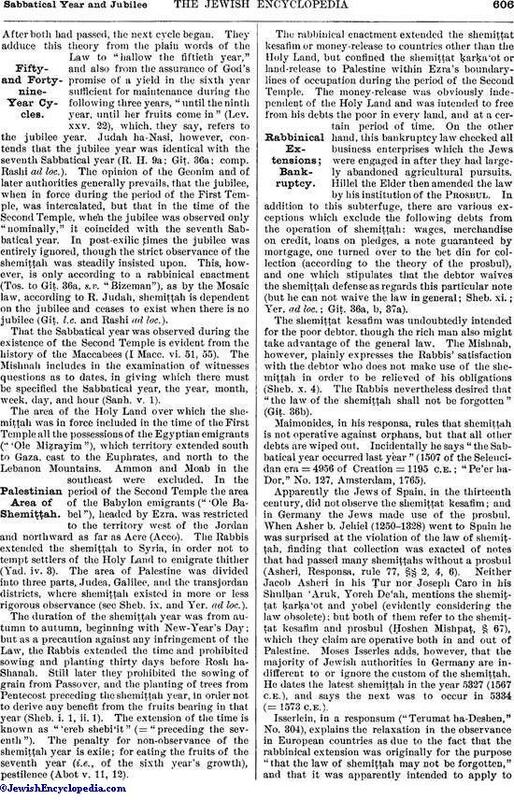 Rabbenu Hananeel claims that the closing of shebi'it—that is, shemiṭṭah—was the year after the destruction of the Temple.